Residential high-rises have begun to surround Hell's Kitchen on three sides, but the heart of the neighborhood still has low-rise apartment buildings and a vibrant commercial life. WALK around the edges of Hell's Kitchen these days and witness a kinetic jumble of scaffolds and cranes. Next to a neighborhood with a decidedly low-rise profile, developers are adding a crop of residential high-rises next to the buildings that have already taken root along Eighth Avenue, and in the low 40's and the high 50's. One of the latest and more striking arrivals is the blue-tinted Helena, a rental building rising 38 stories above West 57th Street and 11th Avenue. Another new development, the Orion, which is just starting to be built on West 42nd Street, will have 550 condominiums in a 60-story glass tower when completed. Yet the core of the neighborhood, which is still mostly called Hell's Kitchen despite civic efforts to impose the more sanitized name of Clinton, is made up of quieter side streets lined with brownstones and smaller apartment buildings. The avenues that run through Hell's Kitchen, meanwhile, have the range of ethnic restaurants, sandwich shops and coffee houses, hardware stores, clothing boutiques and even Laundromats that keep the street-level lively. Yet even with the activity and a growing clamor for its real estate, residents say that what they like most about Hell's Kitchen, whatever they call it, is that it is the laid-back foil to the theater district and Times Square. "People would live here no matter what we called it," said Linda Fenn, a senior vice president with Prudential Douglas Elliman. "We are amazed by the demand." Buyers and renters are flocking to the area's diverse offerings: late-1800's tenement-style walk-ups, brownstones with huge stoops, Art Deco elevator buildings and the full-service high-rises. Last November, Anand Dutta and his wife, Kara Rappaport, bought a 1,005-square-foot two-bedroom, two-bathroom condo at Worldwide Plaza, at 49th Street and Ninth Avenue, for $882,000. 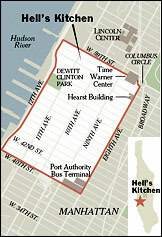 Mr. Dutta said he thought Hell's Kitchen was a sound investment. "We felt this area was untapped and great value for the money," said Mr. Dutta, who also enjoys a 10-minute commute to his Park Ave investment-banking job. Others, like Tony Simone, who rents a 850-square-foot prewar one-bedroom on 47th Street between 9th and 10th Avenues, is there because of a thriving gay community, and one that's more affordable than the West Village or Chelsea. "It has an old New York feel, with so many mom-and-pop shops, and people who live on the same block talk to each other," Mr. Simone said. Arthur Lee and Jann Leeming, empty-nesters from Effingham, N.H., said they are old enough to remember when Hell's Kitchen was hellish. Still, they recently bought an 1,800-square-foot one-bedroom at Loft 55, a former water bottling plant on 55th between 9th and 10th Avenues, for $950,000. "We just like the excitement of what's going on," Mr. Lee said. "And this looked like an attractive area." It is a testament to how quickly a checkered reputation can give way to a better one. In previous decades and earlier centuries, street gangs and some of the city's most dangerous criminals ruled the streets of Hell's Kitchen, which traditionally stretched from the lower 30's to 59th Street, west of Eighth Avenue. There are many versions of the story of how the area got the name, including one that ascribes it to an infamous tenement at 39th Street and 10th Avenue. Today, crime in the neighborhood is down significantly, as it is in the rest of the city. Many of Hell's Kitchen's mega-dance clubs have also closed their doors in the last few years, cutting off a source of drug dealing and noise, residents said. Yet the newfound interest in Hell's Kitchen real estate may stem, at least in part, from Midtown's slow creep westward, epitomized by the gleaming Time Warner Center at Columbus Circle, which looms over the neighborhood's northern edge, and the new crinkle-faced Hearst skyscraper, at Eighth Avenue and 57th Street. Anthony M. Borelli, the district manager of Community Board No. 4, said the neighborhood's patchwork zoning allows for the high-rises around the edges of the district. But he said 11th Avenue, and its long line of car dealerships, is still mostly zoned industrial. The low-slung center of Hell's Kitchen, however, is protected by the Clinton Special District, which restricts the height of new apartment buildings and limits commercial space to local retailers. At first, Mr. Borelli said, "developers saw the zoning as a barrier, but now they think the regulations have made the neighborhood attractive." Developers are betting on buildings like the Helena, at 601 West 57th Street, which will have 597 units ranging from 500-square-foot studios to 1,300-square-foot two-bedrooms. Tenants, who will pay from $1,800 to $5,000 a month, will begin to move in at the beginning of March. Also, 20 percent of the units have already been leased to tenants who make less than half of the median income in New York City, a plan coordinated by the Settlement Housing Fund. The Helena is also an environmentally sensitive "green" building, with solar panels on the roof, interior walls made of recycled gypsum and a parking garage that will have charging stations for hybrid cars. The 550 condos in the Orion, which is being built at 350 West 42nd Street, are to go on sale March 1. Prices in the building, which is being marketed by the Corcoran Group, range from $600,000 for a 525-square-foot studio to $1.7 million for a 1,450-square-foot three-bedroom, according to Raizy Haas, vice president for development at the Intell Management and Investment Company, the developer. Occupancy is expected in the spring of 2006. Ms. Raizy said that Gary Burnett, the president of Intell, which also developed the W Hotel in Times Square, bought the air rights around the Orion, which shares the block with the Port Authority Bus Terminal and a post office, giving residents unobstructed views above the fifth floor from floor-to-ceiling windows. On a smaller scale, there is WFifty8, a limestone former telephone company building on 58th Street between 9th and 10th Avenues that Elad Properties is developing into 16 condos, 14 of which have already been sold at prices ranging from $1.4 million to $5 million, said Tom Elliott, vice president for marketing and design at Elad Properties. Many eyes are on the Windermere, a crumbling eight-story single-room-occupancy apartment house at Ninth Avenue and 57th Street that has been wrapped in scaffolding for the last few years, but City Councilwoman Gale A. Brewer said she was trying to persuade the owner of the building to sell it, so that it might one day contain a mix of market-rate and low-income units. Other new rental buildings taking this approach include the Clinton Parkview Apartments, at 555 West 52nd Street, which will have 137 units when it's completed this summer. P&L Management of Brewster, N.Y., is taking applications for the low-income units. Contact (800) 734-7756. At Clinton Green, which will eventually be constructed on both sides of 52nd Street at 10th Avenue, with 600 apartments as well as theaters and shops, 20 percent will be low-income units, but the leasing of those units has not yet been arranged. One drawback to Hell's Kitchen is that the densely settled neighborhood is starved for open space. Most green spaces are midblock and small, tucked onto blocks like West 47th and West 45th Streets. But that's changing. The cleaned-up five-acre Dewitt Clinton Park, framed by 52nd and 54th Streets and 11th and 12th Avenues, is popular among baseball players and joggers. Another popular option is the Hudson River Park bike path along the West Side Highway, and this spring, residents will also be able to sun themselves at Clinton Cove Park, a two-acre project on the waterfront between 54th and 56th Streets. And Pier 84, at the end of 44th Street, is also being converted to an as-yet-unnamed park that will feature a dog run and amphitheater. Barbara Feldt, a community advocate and garden-book author who has lived on West 44th Street for the last decade, said that already, the view from the pier is inspiring. "You can walk out there and see and fish in the water and cormorants flying around," she said. "It's incredible." 96 units 92,806 Sq. Ft.
"The Flats and the Old School represented the vanguard of social progress at the end of the 19th century," stated Joe Restuccia, Executive Director, Clinton Housing Development Company. "Unraveling the long stalled urban renewal plans of the last century took over 25 years of community persistence. Over a hundred years later, a combination of public and privateinvestment, local initiative, and a forward thinking city government has provided a new model for the 21st century in creating a community of diverse incomes and social needs." Scope of renovation: The transformation of a three-story obsolete two-family building into a six-story apartment complex. The building features a modern, geometric-patterned façade made almost entirely of glass with vertical accent panels of yellow, green, and blue. "Rockrose likes to do rental housing. It's what we did in the Village, on Wall Street and Long Island City. It's what Rockrose is good at, being first in a new area." Residential development giant Rockrose just snatched up a long-elusive corner site at 10th Avenue and 37th Street, giving the Elghanayan family an extraordinary strategic beachhead on the supercharged far west side. It has two complete, facing block fronts in an area being rezoned to allow much larger buildings. Rockrose planning director Jon McMillan confirmed the company now owns both the full, east and west-side 10th Avenue block fronts between 37th-38th streets. Sources said Rockrose spent a total of about $35 million to assemble the block's west side over the past five years, a figure McMillan would not confirm. Anne DeMarzo, whose DeMarzo Realty specializes in the sale of parking lot properties, brokered the sale last month of the corner site. "I completed the assemblage by getting the corner lot I had tried to get the owners to sell since 1997," she said. She said the $10 million purchase cost Rockrose about $200 per buildable square foot. When Rockrose — one of six developers that have teamed up with the Jets to bid on the MTA rail yard — started snatching up properties on the block four years ago, DeMarzo said, it was paying $60 per buildable foot. That was long before anyone knew of the nearby Jets stadium/convention center plan or new rezoning, which will permit large-scale residential and commercial development in what's now a manufacturing district. Although other developers have bought land nearby, none has control of both sides of a full block. Rockrose's planned new apartment projects will face one another across the avenue rather than stand isolated in the low-rise, still grungy neighborhood. Rockrose already owns Manhattan buildings with 5,000 apartments. In addition, 3,500 new units are in the pipeline at Queens West in Long Island City. McMillan said, "Because we got in early, before values went up, we are going to be able to build rentals. With the much higher numbers you see today, a developer really needs condo sales to justify their investment. ...a breakthrough in services and community living at an outstanding value. At The Village at 46th & Ten, we offer the latest concept in community living for older adults who need that extra assistance to live comfortably and securely in their own apartment. in every apartment. Trained personnel are on-site 24 hours a day. • Comprehensive wellness program and wellness director/registered nurse, with blood pressure and weight monitoring and educational offerings to promote practices conducive to good health. • Expanded assistance with escorts, monthly medication review, help with personal hygiene, daily medication reminders and shower and bath monitoring as needed. • Enhanced dining experience with special diets, diverse menus and nutritional counseling and guidance. • An individualized personal services program. The Village at 46th & Ten is sponsored by Village Care of New York, a highly regarded, not-for-profit organization that has been serving the community for more than a quarter of a century. At Village Care of New York, we believe in wellness, restoration and the promotion of well being. In our mission of community service, we strive to understand the desires and needs of seniors, and at The Village at 46th & Ten, we provide suitable housing opportunities that reflect what we learn from seniors. The Village at 46th & Ten is a brand-new community offering services that have long been missing in Manhattan. For more information and to request an application, e-mail or call us at (212) 977-4600. The Village at 46th & Ten is located at 510 West 46th Street. Join us for "Tea and Tour at Two" every Tuesday afternoon. • Library with computer and Internet access. • Exercise room with fitness equipment. • Large outdoor roof deck and garden area. • Private dining facilities available for special occasions. • All apartments wired for cable television and telephone. • Rooms have extra phone lines available for computer. • Full-size gas stoves and refrigerators. • Two delicious meals daily, served in our gracious dining room. • Smoke detectors in all rooms and common areas. • Emergency call system in each apartment. • Telephones with speed dial to security and lobby desk. • Social, cultural and recreational programs and activities. • Professional recreation and case management staff. Additional services are available on a fee-for-service basis. These prices are all-inclusive, covering rent and services. Two 19-storey buildings face each other on the north and south sides of 52nd Street between 10th and 11th Avenues in Manhattan. The towers are set back from the lot line to create a square that straddles 52nd Street. A repetition of shipping container sections on 3 levels defines the boundary of the square. Starting from the ground floor of the two 19-storey buildings, the façade extends and wraps around the four corners of the square 360 degrees providing a shaded loggia for public use all around and creating a stronger feeling of outdoor enclosure. The towers house theaters, café and restaurants on the ground level and residential units above. The square becomes an animated urban space that can be enjoyed by theatergoers, restaurant patrons, passersby and residents alike. The square integrates this new mixed-used complex into the urban fabric creating a new focal point within this fast developing neighborhood. Shipping container sections stack vertically also along the façades of both towers creating outdoor loggias for the residential units. The loggias alternate with glass panels and concrete panels to define the entire façade. The ground floor of the whole complex is entirely occupied by public functions. The 30-foot height of the entire ground floor is exploited to create a mezzanine space that integrates all the support spaces for the theaters and commercial spaces. Last edited by Derek2k3; March 30th, 2005 at 03:16 PM. Somewhere on the same block as the last project. This new facility for a highly regarded not-for-profit theater company in Manhattan is currently in the final stages of design. The facility will combine 50,000 square feet of renovated space in an existing ten-story factory building with an adjacent 35,000 square foot new structure which will house a new 499 seat theater. The completed project will include two more theaters, twenty state-of-the-art rehearsal spaces, public areas, a gallery, a cafe/commissary, administrative offices and three studios for artists in residence. Core-and-shell design for this new 10-story 100,000 ft2 cultural arts center containing a 500-seat theater, two 100-seat theaters and dance/rehearsal studios. Clinton is still to see a nice building, the west side redevelopment should spur better designs. MORRISTOWN, NJ – July 15, 2003 – In its 21st Annual Awards for Excellence in Design, the Art Commission of the City of New York has awarded the New York City Department of Sanitation and Edwards and Kelcey an “Excellence in Design” Award for the new Manhattan Community Districts 4/4A/7 Vehicle Storage and Maintenance Facility. The new NYC Department of Sanitation Vehicle Storage and Maintenance Facility is located in an important and highly visible area beside the Hudson River on the east side of 12th Avenue between West 55th and West 57th Streets and spanning West 56th Street. At some point in the future, a park is planned at the waterside, opposite the facility. The area is experiencing positive redevelopment along the entire length of Route 9A, from Battery Park to 59th Street. The new facility is regarded as a flagship structure by the NYC Department of Sanitation. The architecturally enlightened and advanced design was developed collaboratively by the Department of Sanitation and Edwards and Kelcey to enhance the area’s positive image and prospects for future development. With a sweeping glass exterior façade, the four-story facility with a total usable area of 450,000 square feet features separate administrative offices, truck and mechanized sweeper maintenance and storage facilities, interior fuel islands and vehicle washing, and underground employee parking for each of the DOS’ three operating units designated as Manhattan Community Districts 4/4A&7. and design scene since our founding in New York City in 1946.” The firm’s Manhattan office is located at 1501 Broadway. The Art Commission is the New York City agency that is responsible for the review and approval of works of art, architecture, and landscape architecture on City-owned property. The Commission reviews a wide variety of projects for their aesthetic appropriateness, including construction and restoration of buildings, parks and playgrounds, and the design, installation, and conservation of artwork. Founded in 1946 as a transportation leader, Edwards and Kelcey is a nationally recognized engineering and design firm serving public and private clients in highway, airport, facilities design, communications, rail transit, environmental, and technology systems projects. Headquartered in Morristown, New Jersey, the company has 1,100 employees and 27 regional offices. Once a turn-of-the-century telephone exchange office, WFIFTY8 at Columbus Circle has been thoughtfully designed to combine downtown-style loft living with classic uptown amenities and services in a unique boutique condominium. The original five-story building has been cleverly embellished with six new, ultra-contemporary floors. There are only 16 homes with a variety of floorplans, including 2 and 3 bedroom duplexes and simplexes. Penthouse residences each have spacious outdoor terraces. Master baths offer a perfect equation of marble, stone, glass and tile. A custom-designed vanity of glass and American walnut is the base for a polished steel sink and wall-mounted faucets. The frameless shower enclosure adds a sculptural element. A realm of tranquility and peace awaits. Refined guest bathrooms feature walnut trimmed vanities, hand-set ceramic stone floors and walls accented with a frieze of glass tile. An inviting powder room shimmers with terrazzo tile floor, a sleek, mirrored Kohler vessel sink atop a polished white marble vanity. The elegant lobby entrance and sitting area set the stage for the sophisticated style of the WFIFTY8 residences. Your concierge greets you and your guests from a sleek fossilized black marble and oriental wood desk, while the back-lit, bronzed leather wall and downlighting sets a refined mood. A glass entry and recessed niche add to the cosmopolitan surroundings. Still, a lot of cheap and regrettable stuff. John Jay College is a liberal arts based college dedicated to education, research and service in the fields of criminal justice, fire science and public safety. It is a singular academic institution whose goal is to promote an integrated liberal arts and professional education. Due to increased enrollment and demand for criminal justice education, the college is planning to expand its facilities adjacent to existing Haaren Hall. This 620,000 square foot project is not only a new building for expanded instructional space; it is actually an opportunity to integrate all functions into a unified urban campus, creating an academic city within the city. Love this church right behind WFIFTY8 at Columbus Circle . 109 units 89,307 Sq. Ft. The Clinton is a 109-unit rental apartment building located in the Clinton neighborhood of midtown Manhattan, which has been transformed over the past few years by a spate of new residential developments. This seven-story building with studio to two-bedroom apartments features an attractive brick structure with large windows reminiscent of the historic West Clinton area. The neighborhood is vibrant and diverse with a mix of brownstone and tenement buildings providing a distinctive character while the construction of the Clinton portion of the new Hudson River Park will provide waterfront access and increased recreational opportunities. The Clinton was developed with Altman Burack Partners and designed by Perkins Eastman Architects PC. Last edited by Derek2k3; April 14th, 2005 at 07:05 PM.